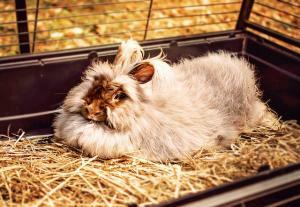 Rabbits, guinea pigs and hamsters or, as they are often referred to, ‘small animals,’ are present in roughly 2 million UK households, according to the Pet Population report. This includes hamsters and gerbils, as well as more uncommon pets like chinchillas and degus. This goes to show how popular they are and how far-reaching their appeal. Whether it’s because they’re smaller, have shorter lives, are more easily handled or are less demanding of money and time, small animals certainly have a place in modern life. It will probably come as a shock then that rabbits, guinea pigs and hamsters are some of the most neglected pets in the UK, with many people underestimating their needs and cutting corners with their care. The biggest problems seem to be poor diet, lack of enrichment and cramped habitats, quite possibly because some owners consider them low-maintenance substitutes for bigger pets like cats and dogs. Rabbits and hamsters are commonly given to children as ‘starter pets’ or as stepping stones from a simple goldfish to a dog. In truth, small animals have very specific care needs, which shouldn’t be overlooked. They might be smaller than other pets, but their life expectancies and general happiness and health are still a big product of their care. When it comes to habitats, all small animals need space and stimulation to thrive. The bigger their living space the better, although the size of hutches and cages can vary greatly. You can find minimum sizes online, although everyone has different views on what is and isn’t big enough. For rabbits, the RWAF (Rabbit Welfare Association and Fund) advises the minimum size for a hutch should be 180 x 60 x 60cm, and for a run 244 x 122 x 60cm. For two guinea pigs being housed today, the RSPCA recommends a space no smaller than 120 x 60 x 45cm. Minimum requirements for hamster cages vary hugely, although some sources suggest a measurement of 75 x 40 x 40cm and above is acceptable. Across Europe, requirements and advice varies just as it does depending on the breed of rabbit/guinea pig/hamster. Because of the uncertainty, many people choose to fashion habitats themselves to provide the space they feel happy with, which is a fun exercise and means you can customise the habitat with your pet’s needs in mind. Some people choose to convert empty sheds or create small animal complexes by attaching multiple hutches and runs together. Others create bigger spaces indoors for their pets to come and go as they please in a safe and sheltered environment. The use of storage grids/cubes is popular and convenient, allowing you to expand or reduce the size of your habitat. Ideally, your small animal should be able to hop, skip and jump in its enclosure and have enough room for daily exercise. Whether inside or out, the habitat should be secure, sheltered, well ventilated and comfortable, as well as being enriching enough to keep your small animals alert and entertained. There are many toys on the market these days geared at doing this job, including chew toys, mineral stones and rollable treat dispensers. Products for maintaining teeth and claws, regulating your pet’s temperature and encouraging nesting and foraging can also be found, helping to enhance the habitat even more. Hi - if the children have outgrown a wooden wendy house then they are perfect to convert into a hutch! My 2 rabbits love it - loads of ground space and room for levels as well. My husband converted ours and added a large run on the outside over a weekend. So sad that small animals get neglected - they are so entertaining and loveable!! I should know - we have 5 hamsters, 6 gerbils, 7 rats and 2 rabbits !